More than 40 MTB- & BMX-Cyclists participated at the third EX&HOP contest. 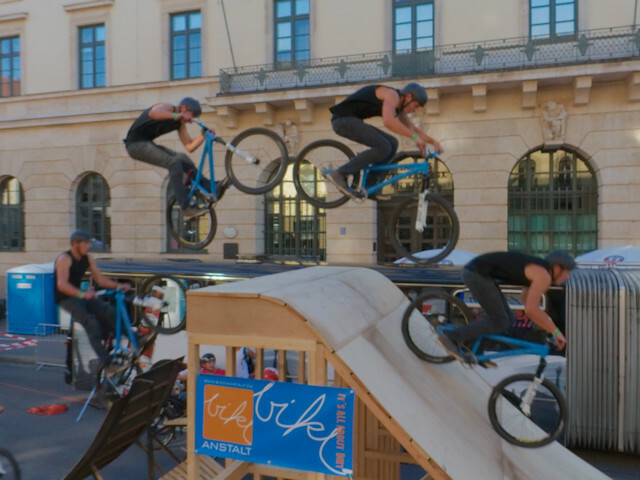 It was part of the Munich Streetlife Festival. The Horseshoe Falls is a part of the famous Niagara Falls. This is where the Niagara River drops around 50m (165 ft on the Canadian site) on its way to the ocean. The American Canadian border runs through the falls. This image shows a Droste type reprojection of the summit of the Imberger Horn. Another ten minutes until sunrise. This panorama has been stitched from 15 individual fish eye images. I combined the panorama using PTGui and used exposure fusion for creating the final panorama from three bracketed shots. The Tower Hill Wildlife Reserve is one of the many parks in Victoria (AUS). The viewpoint is on top of Tower Hill, which can be reached with a short hike from one of the carparks. The park iself is situated in an ancient volcanic crater.